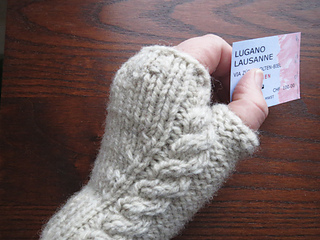 SBB Mitts is a bonus pattern from Holiday in Zermatt, a collection of four colorful cozy hats for the whole family. 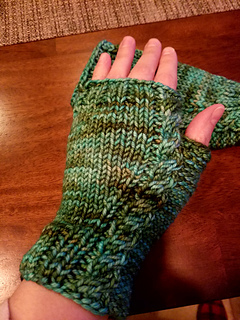 These fingerless mitts are easy and knit up quickly. The small and medium sizes can be completed with less than 50 grams of aran weight yarn, making them the perfect project for that single skein of souvenir yarn that will always remind you of a special vacation. 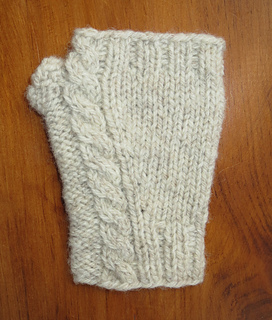 s (m, l), finished hand circumference of about 6 (7, 8) inches, about 5 (5½, 6) inches from cuff to top. approximately 54 (70, 90) yds / 50 (64, 82) m aran weight yarn.